A ‘lost pet’ style poster is stapled to a Sunset Boulevard phone pole. Rip away tabs hang off of it. Someone please tell me I’m not the only one who remembers that commercial. I think we need a bigger box. 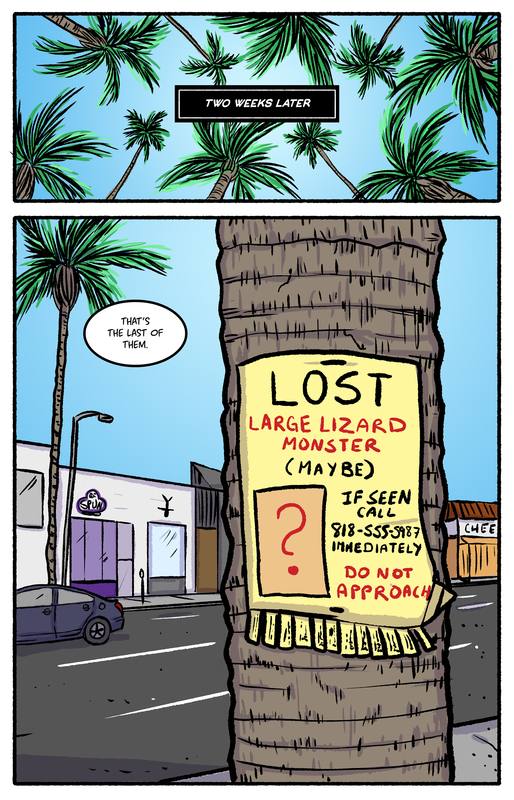 But without a picture, how will people know which large lizard monster they’re looking for? So, wait: we’re glossing over fighting each of the beasts? We’re jumping right to having collected all the MacGuffins? What kind of Magical Girl anime is this? Or… did they try to fight this one and it got away? Also it’s last of the flyers, not last of the MacGuffins. I’m thinking they are going to have to look underground. When the waters of Venus vanished, the book showed it going underground, so that’s my first guess. Largest body of water in the city for the desires it can no longer satisfy would be my second.